It seems like such a small thing, but I really love that EQ7 displays the dimensions of my quilt right there at all times. Look down in the very bottom right – it says “Quilt: 85.000 x 85.000 (ins)”. It also shows the dimensions at the top right, as “Overall Size.” And for those who use the metric system, you can easily change the default measurement from inches to centimeters. Seeing the size of the quilt seems minor, but it helps me decide how big to make the blocks and how wide to make the sashing or borders so the finished quilt fits the wall space, bed or very tall person’s lap. Another great reason! You’re making me want it! Are you sure you like EQ? LOL! I have had the program ever since it first came onto the market. I don’t utilize it as much as I should but it is a handy thing to have. 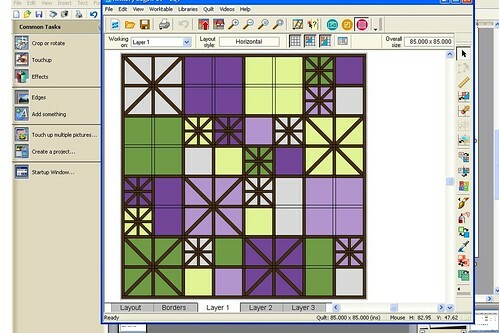 I haven’t designed many quilts, but I just finished one designed by default. I made a quilt with rows of geese divided by stripes of fabric. But first I made the geese twice the size the pattern called for, and then I didn’t realize the stripes of fabric in between were actually a striped fabric. They weren’t straight. It was horrid. But I liked the fabric too well to tosses it, so I took the whole thing apart and turned it into a medallion. Just finished it…ready to quilt. It is now a 72″ quilt that will fit my kitchen table.